Whether it's football stickers, stamps, rare vinyl or midcentury modern furniture, most of us will find ourselves collecting something at some point in our lives; there's something deeply satisfying and almost compulsive about the process of searching out and amassing our own personal treasures. These items needn't hold any particular monetary value—indeed, they needn't even be objects at all. 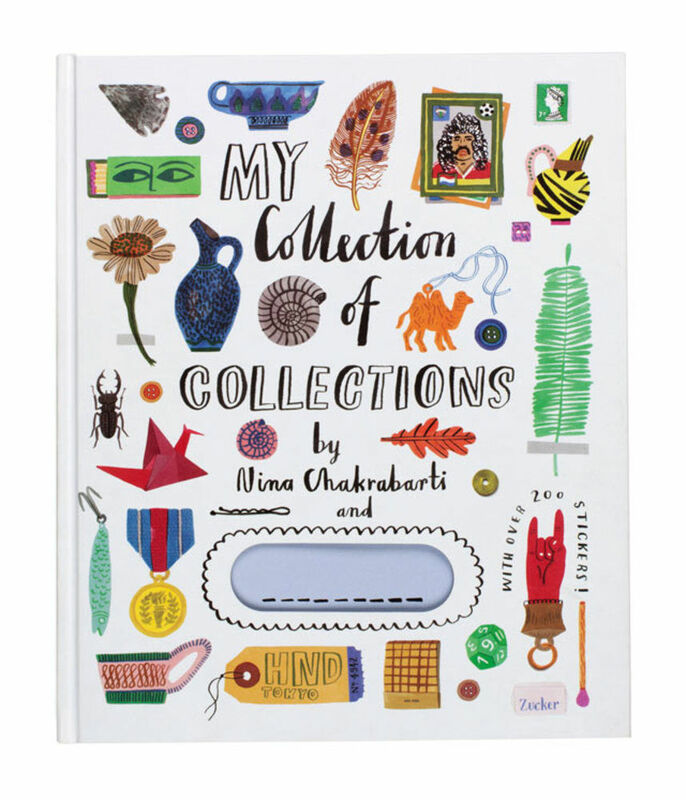 Illustrator Nina Chakrabarti is well acquainted with the joys of collecting, and her latest book, My Collection of Collections, brings together stories from her own personal history as a collector with a fascinating selection of objects, curios and ideas. I have always loved museums. A good museum is a portal into another world. As a teenager, I remember going to the Pitt Rivers Museum in Oxford and my mind being suitably boggled as I gazed at crammed cabinets stuffed full of strange and wonderful objects, including some rather grizzly shrunken heads. Another favourite is the Victoria and Albert Museum where I went for inspiration in the early days of researching this book. 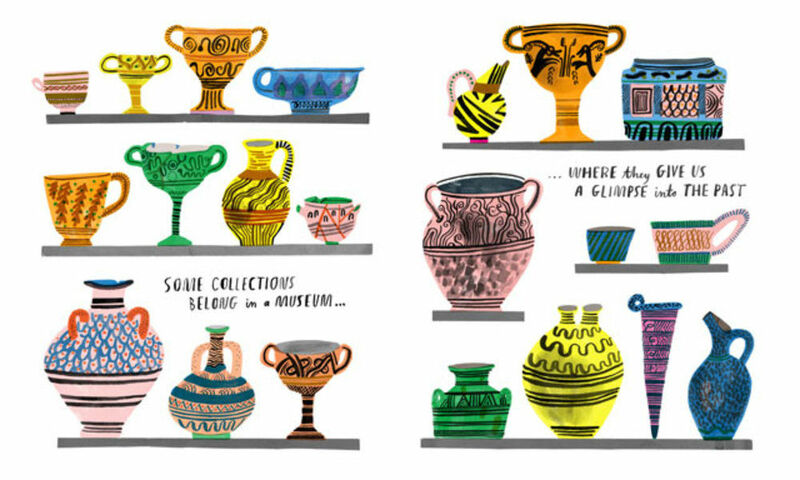 I was meandering my way through the wonderful ceramic galleries when I got the idea for this page, which is the first spread in the book: a display of pots, each one distinct and decorative, with a line about the connection between us and our past. To start the book off in a museum seemed a good and proper place to begin. Somehow, the next few pages came quite easily as a response to this page. I started to think about other types of collections- a child's collection of plastic dinosaurs or football stickers, the unintentional collection that can be found in a lost and found department, a collection that lives in a shoebox under the bed, a collection that lasts for a day or just an hour, a collection that's about many places, or just one (I chose Netsuke—the exquisite, carved objects which are unique to Japan). Our everyday lives are bound up with objects. When I was 12, my family left India to move to the United Kingdom and I had to leave behind my childhood possessions, things I hadn't given much thought to until I didn't have them any more. I was allowed to bring two books, so I chose to bring my dog-eared stamp album and an ABBA annual. I still have both those books and I pulled out the stamp album to have a look at it whilst creating this page. It was a real time capsule of my childhood growing up in 1970s India, with lots of stamps from my African cousins and British grandparents who must have been writing letters to my mother. Stamps were an early introduction to graphic design, seeing how art and text could fit together on these tiny, perfectly designed pieces of paper. 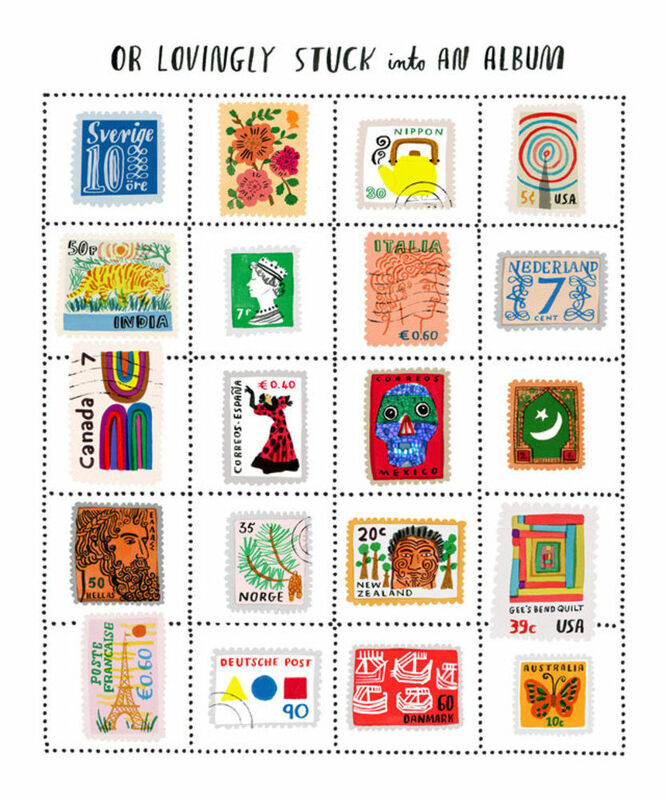 I loved them, especially the beautiful stamps designed by David Gentleman. For this page in the book, as a homage, I replicated some British stamps like the 1976 'Sweet Briar' rose stamp (original price 13p!) and the Indian stamp depicting a tiger. Others I had fun making up, choosing a Makoto Koizumi kettle for the Japanese stamp or the Mexican mosaic skull for Mexico, drawn from a collection I'd seen years ago at the British Museum. Some collections are just for the afternoon. This was exploring the idea that not every collection has to be about stuff. 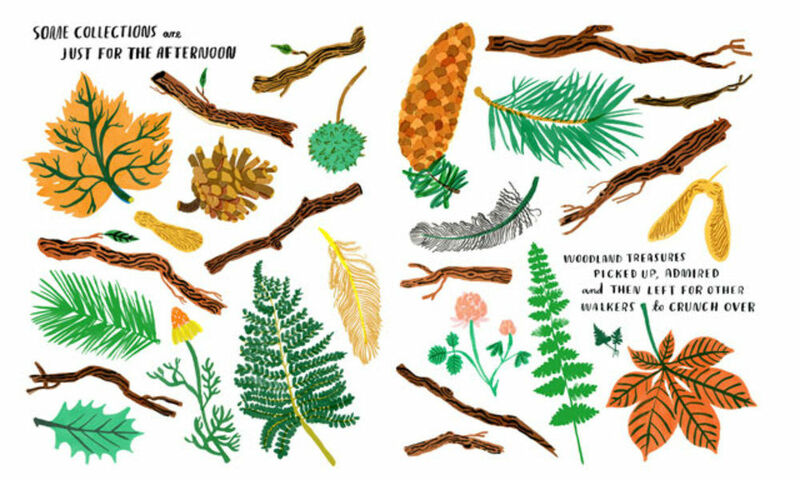 It could be something transient—a collection of memories or different shaped clouds or, like on this page, going for a walk, picking up bits of stick, leaves and pine cones to look at and hold for a little while, then leaving them behind. There's a freedom in not having to accumulate. Increasingly, this is the way I collect now. As an illustrator, I have always collected what attracts me visually. I used to collect all sorts of doodads and ephemera: orange wrappers, matchboxes, printed waxed papers, postcards of Indian film stars, the tiny packets of sugar that you get in cafés, olive tins and so much more but with every studio and house move I got fed up with all the suitcases and boxes I had to lug around full of this stuff, some of which I hadn't looked at for years. Gradually, over the last three years or so, I started getting rid of my collections. I scanned or photographed what I thought might be useful in the future and then gave, recycled or threw the rest out. Now, I have books, records and clothes but not too much else. Also, with the invention of Pinterest, the online cork board, I had found somewhere to put images I came across on the internet without having to print them off and keep them in folders. I found not having so much stuff liberating, but it didn't stop me being interested in what other people collect and why. Here's another spread which isn't about collecting physical objects, but language. I grew up in India and even though I considered English my first language (with Bengali and Hindi my second and third) I thought it incredibly exotic and was unconsciously collecting words I liked and that sounded odd or beautiful to my Indian ears. 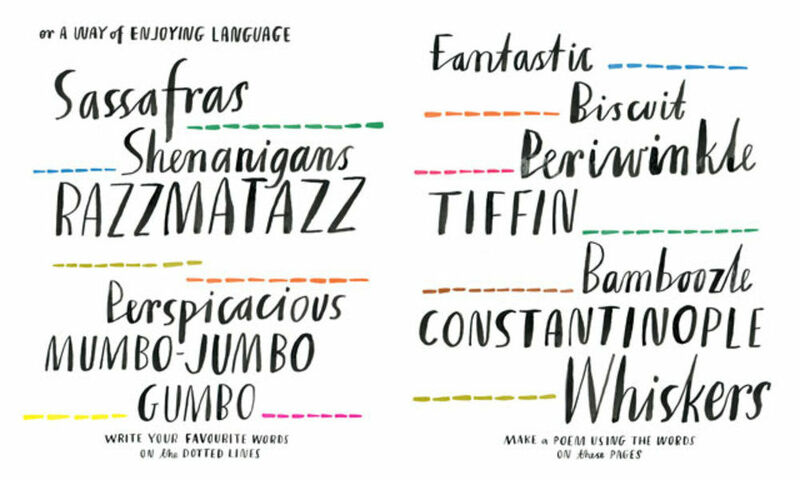 I remember having notebooks in which I'd scribble down new and unusual words, and opening the dictionary at random to see if any weird words would jump out. These happen to be my current favourites but they change all the time. I love reading and can't wait to get my head stuck into a good book. I like to think some children reading the book might enjoy words as much as I do, and add to the collection with their own favourites. I also challenge them to make a poem using all the words on the page. This came from the idea that a family is a collection of humans that belong together, with people having children and then those children growing up and having children of their own and so on. These pages feature a lot of pictures from my mum’s photo collection. She still uses film in her camera, gets prints made and sticks them in an album with captions. If you look at all her photo albums in sequence you can see people getting old right before your eyes. There's a sense of time passing by and lives being documented. I find this interesting as hardly anyone looks at their snapshots in that way anymore. People generally look at pictures on each others' phones or Facebook and it's all about the instant, not reflecting on the past. Early on I wanted to recreate her photo album, but in the end I chose to illustrate the idea with framed photos hanging on a wall. 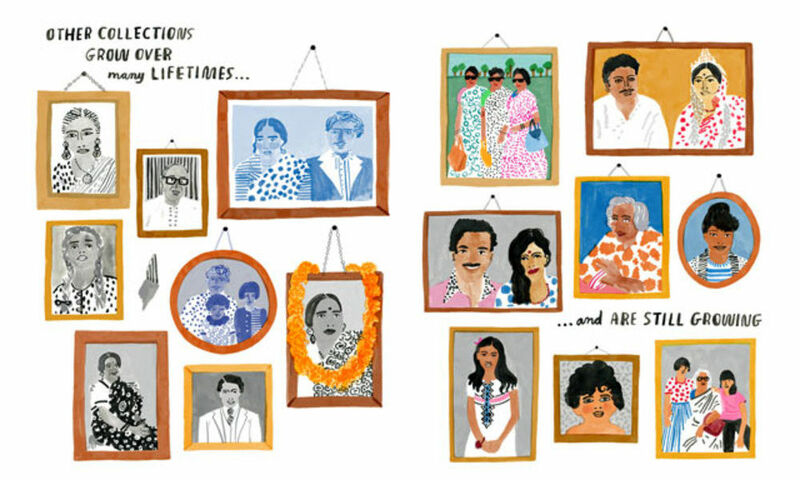 I wanted to evoke our house, where we'd have lots of family portraits gathering dust in formal rooms, and dear departed relatives would get garlands of marigolds draped over the frames. I tried to create a sense of time passing, so the photos on the left hand page are black and white or a tinted colour as they date from the 1930s, 40s and 50s, and then colour creeps in and you have those glorious Kodak prints of the 1960s and 70s. Poses aren't so stiff and formal anymore—I love the snap of the badass Chakrabarti aunties with their saris, handbags and matching Ray-Bans. I'm on this page somewhere; I will leave you to guess where. My Collection of Collections by Nina Chakrabarti is out now, published by Laurence King—get your copy here.